Want to explore the ancient ruins on this amazing full day Machu Picchu tour without the crowds? Or taken an epic llama selfie without a group of people in the background? With this exclusive private one day tour, you’ll be able to experience the magic of Machu Picchu at your own pace with a personal guide. As most one day tours begin at 3am, choosing this mid-morning departure, means you will have ample time to enjoy a full breakfast before the adventure begins. With a private transfer to and from Ollantaytambo, you can sit back, relax and enjoy your journey to this ancient Wonder of the World. (Departures from Cusco or the Sacred Valley). 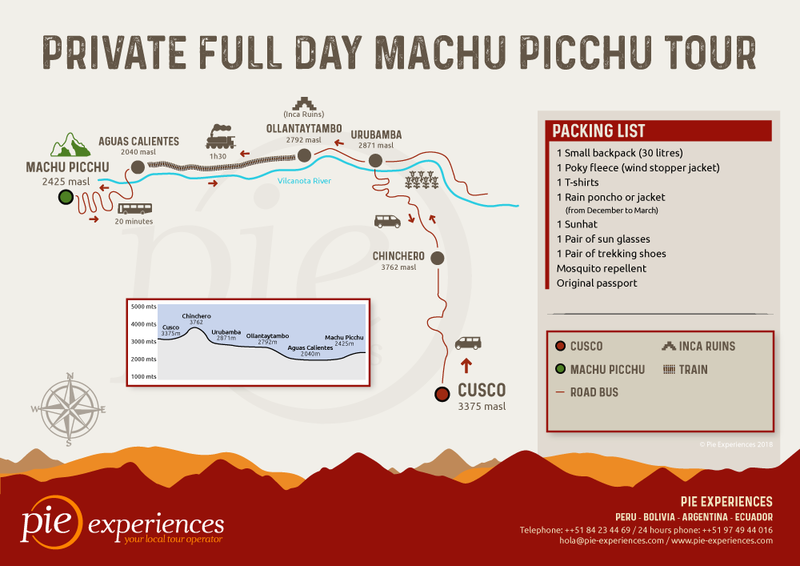 Best way to see Machu Picchu in one day? This tour is the answer! Your full day Machu Picchu tour starts at a more relaxed time of the morning. Your driver will meet you at your Hotel and take you on a picturesque, leisurely drive to the little town of Ollantaytambo. From there you will be escorted to the train station where you will take a classic journey on a modern and comfortable train to the town of Aguas Calientes. Sit back and relax as you take in the beautiful scenery on the way. On arrival to the cute town of Aguas Calientes, a transfer guide will meet you to show you to the bus area. You will then board the bus for a short ride up to the Machu Picchu entrance, where you will be met by your private guide who will take you the rest of the way on your Machu Picchu day trip. Once you pinch yourself to the fact that you are really here, your guide will explain the history of the ruins and you will have plenty of time to explore at your own pace. Don’t forget your camera! Late afternoon, we will head back down to Aguas Calientes where you will have some time to check out this little village before making our way back on the train to Ollantaytambo and then again by private transfer from there back to your Hotel. Tour by car and train. Low point:2000 m / 6561.68 ft. approx- High point:3300 m / 108267.72 approx. Private transfer from Cusco to Ollantaytambo train station. DAY ONE | Scenic Train, Inca Ruins and Llama selfies! A private car with professional driver will pick you up from your Hotel in the morning in Cusco, giving you ample time to have a large breakfast before your full day Machu Picchu tour begins. During the hour and a half drive, you will be mesmerised by the change in scenery. While descending in altitude, you will be surrounded by mountainous terrain and traditional Peruvian agricultural landscapes. The driver will drop you off at the Ollantaytambo train station where you will board the train to Aguas Calientes. Marvel at the lush surroundings that make up the area near Machu Picchu. Arriving in Aguas Calientes, the small village located at the base of the famous Inca site, a transfer guide will be waiting to lead you to the bus station. After boarding the bus for the short ride to this sacred citadel, a private guide will meet you with your Machu Picchu tickets to begin your adventure. You will take a knowledge-filled journey through the ruins of the ancient City. After the guided tour of this new Wonder of the World, take time to explore the complex at your own pace, snap some photos and hang out with the resident llamas. When you are ready, you will board the bus once more and make your way back down to Aguas Calientes. After arriving, stroll through the markets or try the local ice-cream, before boarding the train back to Ollantaytambo. Once in Ollantaytambo, your private car and driver will transport you back to your Hotel in Cusco.